See a 3-D animation of a spotted seal skull. Distribution/Migration: Arctic, North Pacific. In Bering Sea ice front late fall to spring. As ice recedes, move north and toward coast. Migrate offshore when fast ice forms on shore. Pink shows summer range, blue shows winter range. This web page is modified from the book Marine Mammals of Alaska by Kate Wynne, illustrated by Pieter Folkens, available at the Alaska Sea Grant Bookstore. SIZE: Average adult 5 ft (1.5 m), 210 lbs. At birth 3 ft (1 m), 26 lbs. 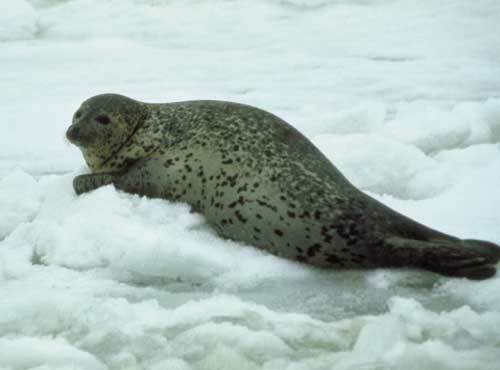 BODY: Medium-size seal with narrow, dog-like snout. COLOR: Dark irregular spots scattered on silver sides and darker back. Pups born with lanugo (soft wooly hair), molt to adult coat in 3–4 weeks. BEHAVIOR: Haul out on ice floes late fall to early summer and on land during warmer mos. Often form triads of female, male, and pup during pupping and breeding season. Gregarious at other times. Known to dive to bottom in waters >800 ft (245 m) deep. HABITAT: Continental shelf to coastal. Seasonally associated with ice front. Avoid heavy ice but use floes at ice front fall to summer. In summer, found near shore, on land, and up rivers as well as far offshore. FOOD HABITS: Opportunistic. Eat small schooling fish, shrimp, octopus. LIFE HISTORY: Sexually mature at 3–5 yrs. Breed April–May. Single pup per yr born on ice in April after 11-mo gestation. Females use shelter of ice hummocks rather than digging lair. Pups wean after 3–4 wks. Annual molt May–June. May live 35 yrs. STATUS AND HUMAN INTERACTIONS: Status unknown. Limited commercial harvest by Russia. Subsistence use by Alaska Natives is approx 5–6000 per yr. Potential for bycatch (in trawls and nets) and competition with commercial fisheries (shrimp, pollock, herring). Vulnerable to reduction in sea ice. Last modified 11 April 2012, 3:56pm AKDT. For website issues, contact Alaska Sea Grant web coordinator.